Rubbermaid Commercial Products is introducing a new standard of excellence in heavy-duty platform trucks. The new line of trucks have been significantly redesigned and expanded to provide meaningful, innovative solutions to the top user needs. Made with new Duramold! Rubbermaid’s innovative Duramold technology produces a precision engineered high-density resin and metal structure. The features of this technology provide significant and valued user benefits over the traditional metal and wood based products in the heavy-duty material handling product categories. This superior manufacturing technology enhances our products by making them more rugged, durable, and reliable for our end-buyers and end-users that ultimately lowers the overall cost-of-ownership over the service life of the product. 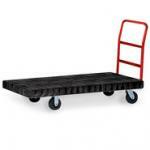 Rubbermaid 4403 HD Platform Truck 24" x 36"
Rubbermaid 4406 HD Platform Truck 24" x 36"
Rubbermaid 4436 HD Platform Truck 24" x 48"
Rubbermaid 4436-10 HD Platform Truck 24" x 48"
Rubbermaid 4441 HD Platform Truck 24" x 48"
Rubbermaid 4466-10 HD Platform Truck 30" x 60"